Well, I thought it was time to throw my hat in the ring on this one and give you my opinion. And just so you know, I’ve used both fasted cardio and fed cardio to get to around 6% body fat. So I’ve got the practical experience as well as having scoured through all the available research. But don’t worry, this isn’t going to be a hefty science lesson, it’ll be simple and to the point. I guess you could say I’ve done the hard work for you and it’s now on you to decide which side of the fence you’re on. Why do its supporters think its great? What does the research tells us about who’s right and who’s wrong? And after all that, I’ll give you my honest opinion about the approach you should be taking. Ultimately, my main focus is to get you results and to do that in the most efficient and enjoyable way possible. Let’s dive into the detail and get you the answers you’re looking for. Let’s start off by making sure we’re all on the same page with this one. Lots of people think they know what fasted cardio is, but in a lot of cases they’re just plain wrong. Fasted cardio is not training when you feel like you’ve got an empty stomach. If that were the case then I’d be in a fasted state almost every hour of the day. Believe it or not there’s a specific definition of what constitutes being in a fasted state and you don’t have to leave it down to ‘feelings’. To put it simply, there are two ‘states’ that your body will be in at any one time. And by state, I don’t mean New York or New Jersey. What I mean is ‘fasted’ or ‘fed’. Now, determining which of those your body is in comes down to insulin levels. When you eat, your body starts the process of breaking that food down into nutrients that can be used for a variety of functions. And as that food gets broken down, your body needs a mechanism for transporting all those great nutrients to the cells around the body. And this is where insulin comes into its own. Because, it’s the insulin that’s the vehicle to get the nutrients where they need to get to. Taxi for nutrients! So, while all of these processes are going on, you’re in a ‘fed’ state. Any time where your insulin levels are elevated means you’re fed, like a stuffed little piggy. How long are insulin levels elevated for? Another important point to remember here is how long that whole process takes and therefore how long you’ll be in that fed state for. This essentially depends on how much you ate. Let’s say you took some clients out for a 3 course lunch in an attempt to convince them you’re amazing and they should do more business with you (although I think they call that bribery and corruption these days, so best avoid that). That big 3 course lunch is going to take more time to be processed by your body than if you’d had the normal tuna salad sandwich from the local deli. It can take anywhere from 3 – 6 hours for your body to process the food you consume. And insulin levels will remain elevated during this period. 6 hours later, after that long day at work, your insulin levels will have returned back to their base levels, at which point you’ll be heading into a fasted state. So, this is why fasted cardio is always considered to be something that has to be done first thing in the morning. The theory behind this being that you might have your last meal of the day around 8am. Therefore, going to sleep for 6-8 hours means you’ll be waking up guaranteed to be in a fasted state. Then you jump straight on the exercise bike and bash out a sweaty session of fasted cardio. But now you know the difference between a fasted and fed state then it’s actually conceivable that you can do that same fasted cardio workout later in the day (if you wanted to). The bottom line here is if you exercise when your insulin levels are raised, you’re doing ‘fed’ cardio. And if you exercise when your insulin levels are at their base level, you’re doing ‘fasted’ cardio. What’s the Theory Behind Fasted Cardio? First of all, let’s analyse a little of the ‘gym theory’ you might have picked up. No doubt it will be along the lines of the assertion that your body has used up all of it’s available energy stores overnight. Therefore, when you hit the stairmaster at 6am your body has no choice but to use up that stubborn fat for fuel. Therefore, your bound to be lighting up those fat stores, much more than you would be later in the day after a day’s worth of food in you. And this does make sense on face value. Because if you’ve just eaten, then your body has just got some brand new nutrients to work with. And doesn’t need to dip into those precious fat stores that it’s saving for a rainy day. So let’s dig into that a bit further and look at what’s going on inside the body using the Iron Paradise Fitness Bus Stop Theory. Yes. You read that right, the Bus Stop Theory (bear with me a second on this one), I’ve not gone crazy, yet. When your body starts to burn fat there are two processes taking place. The first of these is lipolysis, which is where your body frees up fatty acids from fat tissue, which is then deposited in the bloodstream and used for fuel. The second part of the process is oxidation and this is the bit you’re REALLY interested in, because this is the actual “burning” of free form fatty acids (basically, that’s the love handles melting away). So in terms of the Bus Stop Theory, the people getting on the bus are your fat cells and the bus itself is the process of oxidation, which is taking the fat away. And where does lipolysis fit in here? Well, think of lipolysis as the marketing campaign that’s encouraging more and more people to catch the bus. Lipolysis is making the bus stop queue longer and longer. Fasted cardio is proven to increase lipolysis which means that more and more of your fat is getting broken down during that particular workout, compared to the same workout in a fed state. And that sounds pretty good, right? More and more of that dreaded fat is going to be broken down and be banished for good. All aboard the FAT BUS! That said, the important thing to remember is a bus has a fixed number of seats. And even if you cram passengers in like sardines there’s still a fixed capacity. Ultimately, only a certain number of people can be taken to their destination. Likewise, you’re body works in the same way. You’re body can mobilise a ton of your fat cells, but only a small proportion will actually get oxidised and get a seat on the FAT BUS. The vast majority will be converted back into fat (sorry to disappoint you). But what about oxidation? Does Fasted Cardio mean the FAT BUS is bigger and becomes some sort of Mega Bus? While it would be great to tell you that fasted cardio is going to increase your capacity to burn fat, it’s not the case. Because the research tells a different story. 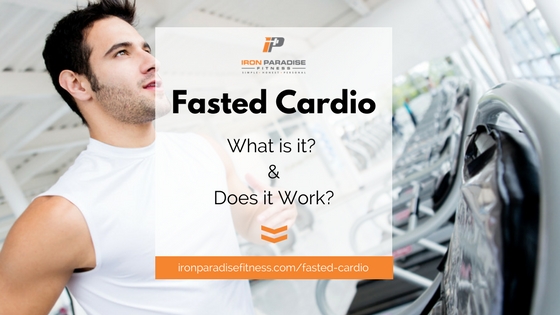 A study conducted by Brad Schoenfeld published in 2014 showed that there is no difference between fasted and fed cardio in relation to increases in the rate of fat oxidation. In fact, this study is interesting to look at for a number of other reasons too. Most importantly, Schoenfeld’s study backs up the theory that fasted cardio does nothing to increase the limiting fat loss factor of oxidation. He also concludes that fat loss needs to be considered over a period of days and weeks. It’s not just the time at which the exercise is completed that’s important. Essentially this means that even if fasted cardio did burn more fat in the 30-60 minutes of exercise versus fed cardio. It would be balanced out by other processes that happen within the body post-exercise. And this is all to do with something called EPOC, or Excess Post-exercise Oxygen Consumption. Which is a posh way of saying calories burned after you’ve worked out. You might hear this commonly referred to as the ‘Afterburn’ effect. Interestingly, the study also concluded that eating prior to exercise actually increased the overall calorie burn compared to exercising in a fasted state. Due to this, we can determine that the thermogenic effect of exercise is enhanced in a fed state. Basically, you’ll burn more fat in the long run with fed cardio. Although, realistically the differences will probably be virtually unnoticeable to the average person. Is there a situation where Fasted Cardio will work? Maybe at this point you’re thinking that fasted cardio is completely worthless. But before you start adjusting that alarm, there’s a couple of other points to consider. Despite the points above, there is research highlighting some benefit of fasted cardio. And these come when combining fasted cardio with supplements, such as Yohimbine. A study conducted in 2006 took 20 elite male soccer players and used doses of 20mg of Yohimbine daily. Over the course of 21 days there were no improvements in muscle mass and performance. However, fat levels dropped from 9.3% to 7.1%. While this study doesn’t reference fasted cardio, a quick look at Examine.com will tell you that the effects of Yohimbine are partially negated by food intake. Therefore, 10-20mg in a fasted state would yield fat loss benefits. A degree of caution should be used as there are some potential side effects you should be aware of. So, always consult your doctor before taking these types of supplements. In addition to supplementation, one of the other key things about fasted cardio is doing what works for you. Now I’m sure you love a lie in just like me. But I know that getting up and hitting the fasted cardio is the only way I’ll actually get it done. Getting cardio out of the way before breakfast works for me. Maybe my brain is just wired that way. I’m self-aware enough to know that I struggle for the motivation to train after working all day. And that’s despite how much I promise myself I will. So, if you’re like me then there’s nothing wrong with doing fasted cardio. Likewise, if you can’t stand the thought of it, don’t torture yourself, just make a plan to get it done at some point. Therefore, adopt the approach that works for you and execute on that consistently. Seems like we’ve covered a lot in this article already, but there’s 2 crucial points I want to finish on. And make sure you focus in on these because they are important. The bottom line is, you won’t achieve fat loss from fasted cardio if you’re not in a calorie deficit. In fact, you can do all the fasted (and fed) cardio you like, but without a calorie deficit, you won’t lose weight or fat. So your diet needs to be set up correctly for you goal from day one to avoid spinning your wheels. Essentially progress can hinge on this fundamental part of your programme. And if you want to learn how to build the perfect diet plan, here’s how. You can register for my FREE ‘7 Steps to Get Lean’ online workshop by clicking on the image below. During the workshop I’ll be there to explain everything from start to finish, including everything from macros to meal timing and supplementation. And just for joining the workshop you’ll get a couple of free gifts from me as a thank you. So if you’re tired of making the same mistakes over and over again then register for free by clicking the image below. When you’re training in a fasted state your body enters a catabolic state where it eats away at that hard-earned muscle, if you’re not careful. So, you want to combat this potential muscle breakdown through supplementation. Traditionally, BCAAs (Branch Chain Amino Acids) are trotted out as the supplement of choice in this scenario. However, BCAAs raise insulin levels and therefore bring you out of that fasted state. In which case, your best option is to supplement with HMB, which doesn’t raise insulin but is proven to be an effective anti-catabolic agent. The majority of the research shows that there’s no material benefit in fasted cardio over fed cardio. Overwhelmingly, it will be being in a calorie deficit and getting your cardio done that makes the biggest difference. Contrary to long-standing beliefs, you don’t have to do fasted cardio to get results. So if you can’t stand the thought of dragging yourself out of bed to train. Then don’t. Leave the alarm clock switched off and hit the treadmill later on. Personally, I adopt a fasted cardio approach, but this is more because it suits my schedule. And I’m also the type of person that struggles to train in the evenings. Because I train fasted, I maximise those sessions with Yohimbine supplementation. However, I’ve got to stress that these are all very marginal gains (if gains at all). Ultimately, you can still get lean and very lean doing regular cardio. Don’t think you have to do it fasted. At the end of the day, find what works for you and what allows you to be most consistent. Because it’s that consistency that leads to results, not the 6am wake up call. Want to know what type of cardio is best? read this article.